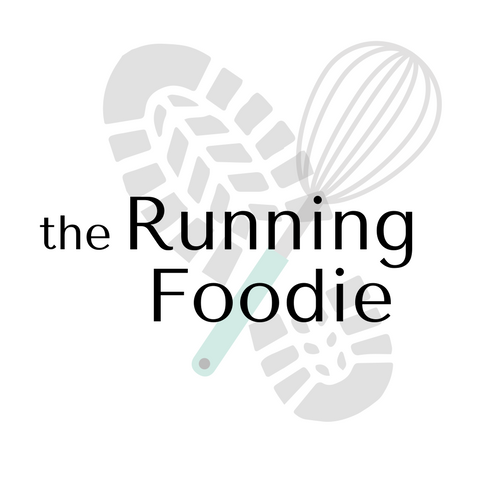 This month's recipe was chosen by Elle from Feeding My Enthusiasms and Deborah from Taste and Tell for Cheesecakes Pops from Sticky, Chewy, Messy, Gooey by Jill O’Connor. I've never heard of cheesecakes pops before, so I was excited to make it because I prefer bite-sized desserts to their regular- and sometimes super-sized counterparts. Also, I liked the whimsy-yet-contemporary feel of this dessert especially. Seeing that the yield for this recipe was high, I decided to only make a half-recipe. I'd still have enough to play around with, but not so many that I'm up to my ears in cheesesicles! From the Daring Bakers board, many of the others had issues with the baking time; the cheesecake took much longer to set than the time stated in the recipe. Was that true for me? Yes, because although my cheesecake set in the minimum time as per the recipe, remember that I halved the ingredients so the amount in the baking dish was less than if I had made the full recipe, meaning it would bake more quickly. 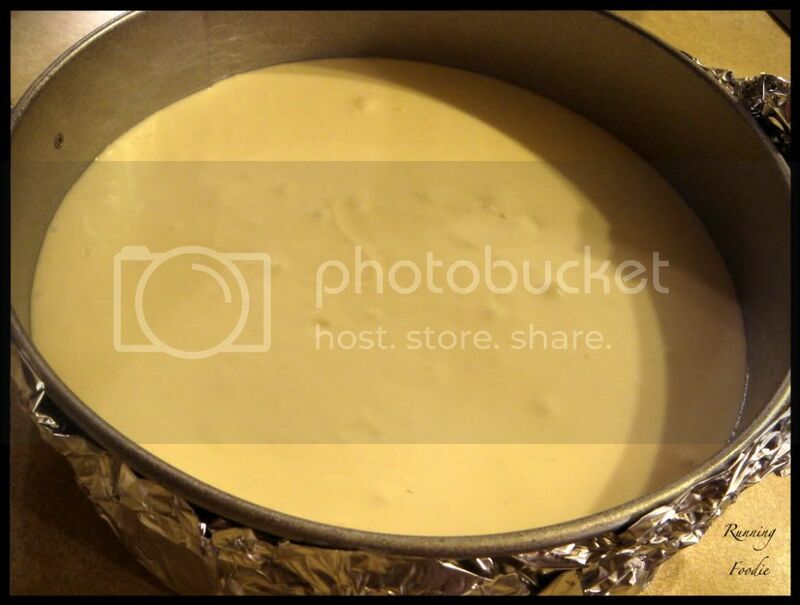 Now about the cheesecake, I love this recipe! It's the first time I used a water bath and now I will never not use a water bath again. The cheesecake set beautifully and didn't crack. Also, the recipe said to use heavy whipping cream, but since I only needed two tablespoons I decided just to add buttermilk instead. It may not have been enough to do anything major (which wasn't the result I wanted, anyway), but I think it added an undertone of tanginess. Mmm! The texture was the perfect consistency. Dense, yet light and smooth at the same time. After resting in the refrigerator overnight, I sliced the cheesecake into small pieces and placed the tray in the fridge to freeze the pops until firm. That's right! Flippin' sweet! There was no way I was leaving without buying it. No way. It's just... so beautiful! It seemed almost a crime to chop it up. I did notice the undertones of honey that the description spoke about, which I was only able to taste after I chopped the bar up. I apologize for the digression. Since we could choose what to coat it with after dipping the pops in chocolate, I had two ideas in mind. First, cashews. Second, cashews with Chinese five spice powder. For the chocolate, I coarsely chopped the cashews. With the white chocolate, I finely chopped the cashews and mixed it with about 1/2 - 1 teaspoon of Chinese five spice powder. I couldn't wait to try these. 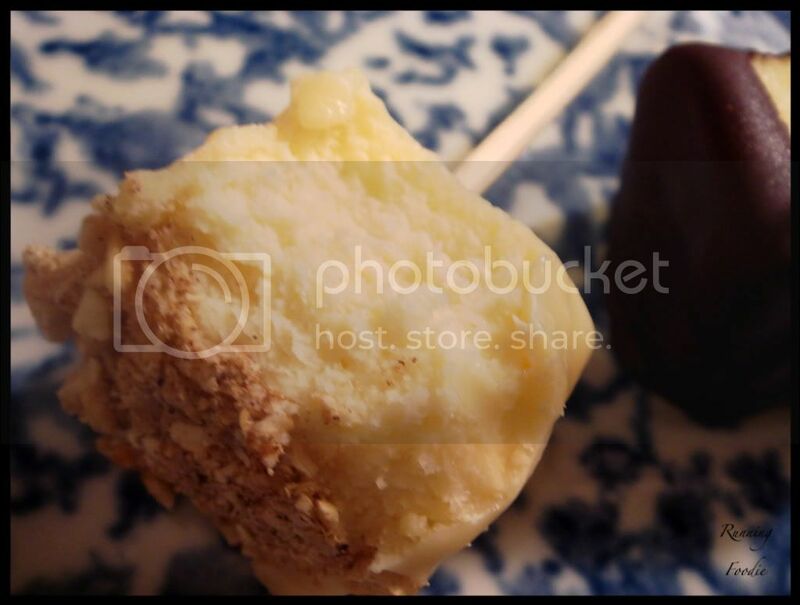 The cheesecake tasted wonderfully and I was anxious to see how the chocolate against the cheesecake, and the cashews with spices against the white chocolate against the cheesecake would taste. OMGooses. My first bite, as you can see, was the white chocolate. I couldn't believe how good the spices and cashews paired amazingly with the white chocolate. It was heavenly. Have you ever eaten something and just knew that it tasted right? This was it. 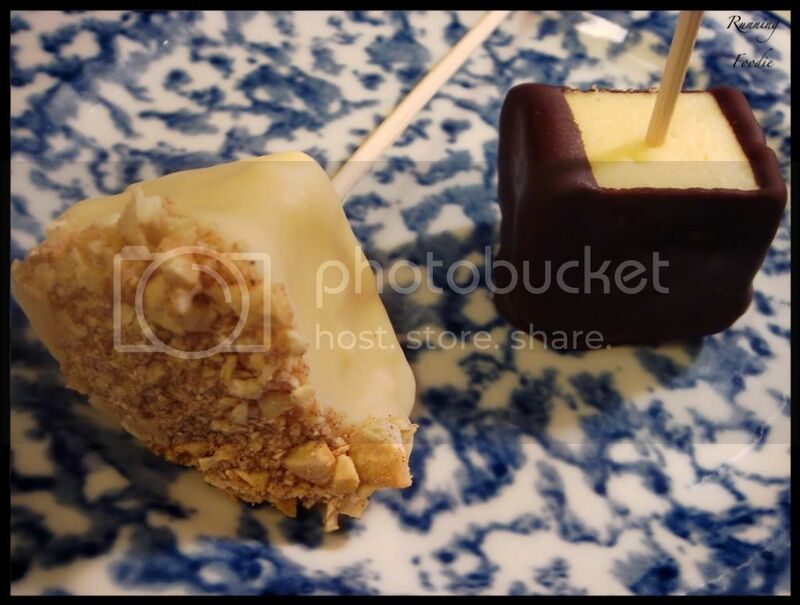 I know I went on about the Scharffen Berger, but the clear winner tonight was the white chocolate pops. The diminutive bites were actually just the right amount for a desert without causing epic distress on my stomach. Thanks again, Elle and Deborah, for choosing a really fun and individual challenge! And to you, the reader, don't forget to click on the Daring Bakers blogroll to read the many other wonderful posts from my fellow DBers! When the cheesecake is cold and very firm, scoop the cheesecake into 2-ounce balls and place on a parchment paper-lined baking sheet. (My note: I sliced the cheesecake into pieces instead of scooping into balls. If you do that, rinse the knife with hot water and wipe clean between slices.) 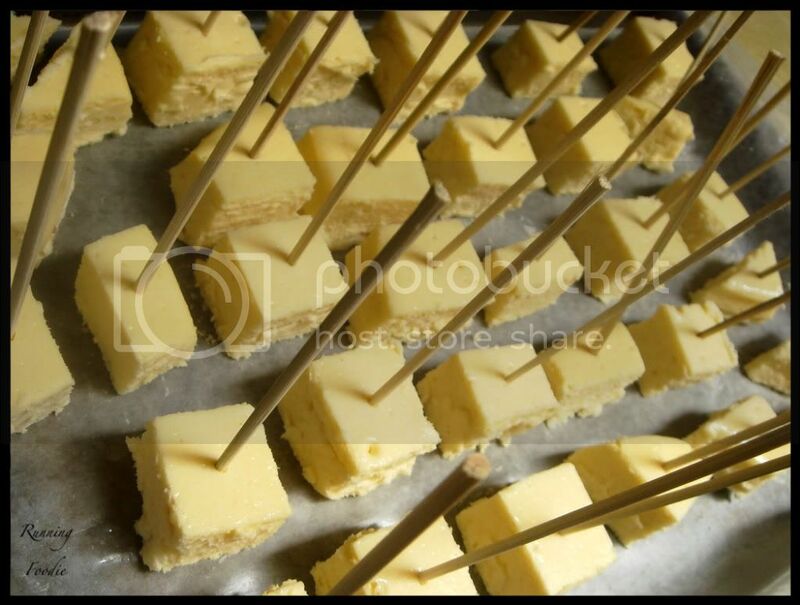 Carefully insert a lollipop stick into each cheesecake ball. 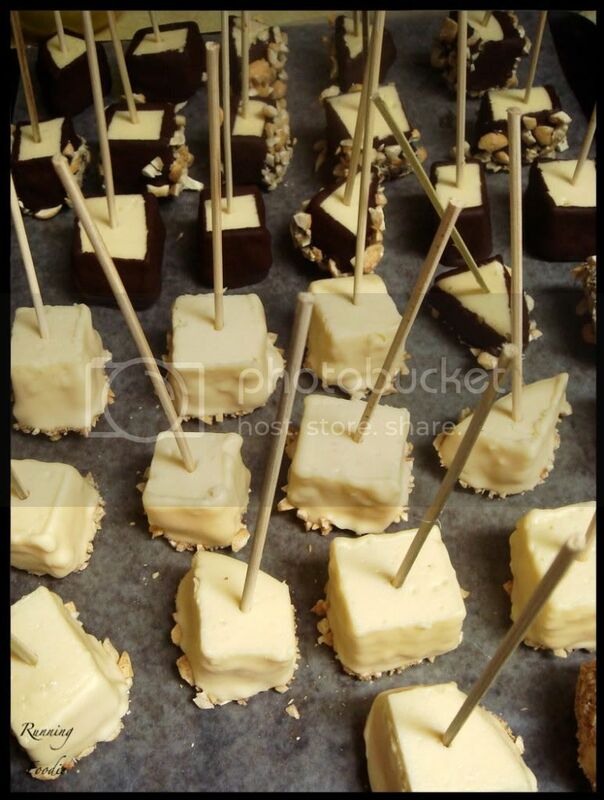 Freeze the cheesecake pops, uncovered, until very hard, at least 1 – 2 hours. Those look pretty incredible. So cute! And with the best of chocolate. So you like Hershey's chocolate or what? 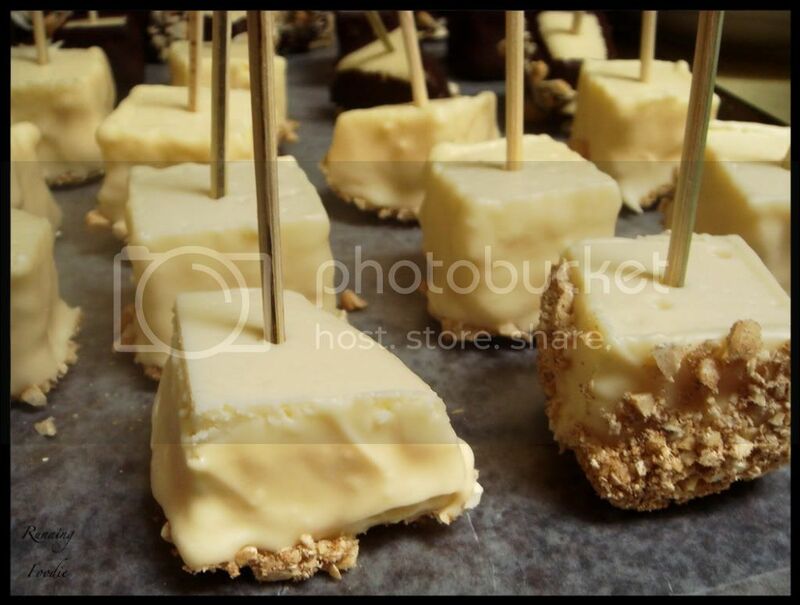 :) I want me some cashewed cheesecake pops in a bad way now. I blame you of course. Yum, chocolate and nuts....GOOD chocolate that is! Great looking pops! very interesting, using 5 spice powder and cashews! I'm tempted to try it. And though i only did one white chocolate pop (hershey's white choc morsels didn't melt smoothly-i'll use white couverture next time) it did taste great with the cheesecake. The dark chocolate was a bit too strong with my thin pops. 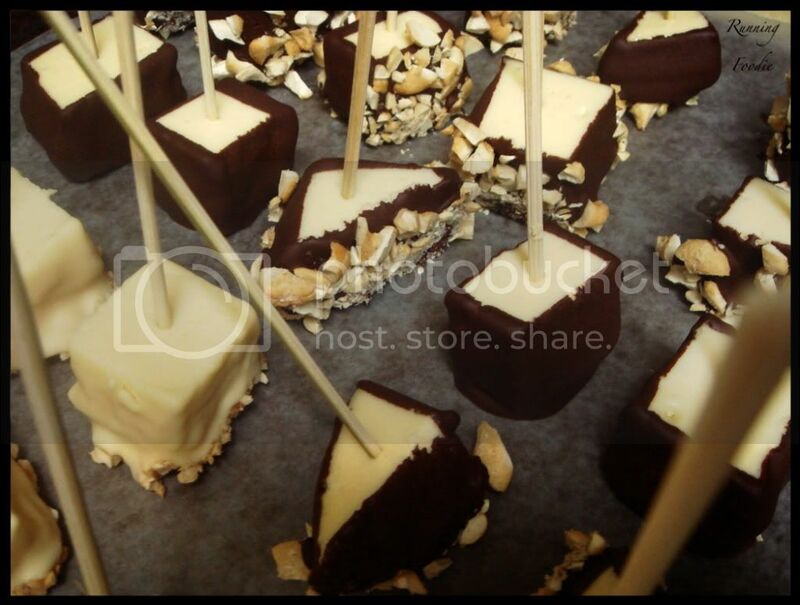 HoneyB - If I had thought about it sooner, I would have toasted coconut and almonds to make a sort of Almond Joy cheesecake pop. But the cashews were just as good! Faery - Thanks for commenting! Pixie - Yes, I've found that chips don't melt well at all, seeing as the whole point is for them to hold their shape throughout the entire baking time. I realized that when I made a ganache once! Christina, I love that you cut yours into cubes, it gives them a chic look! 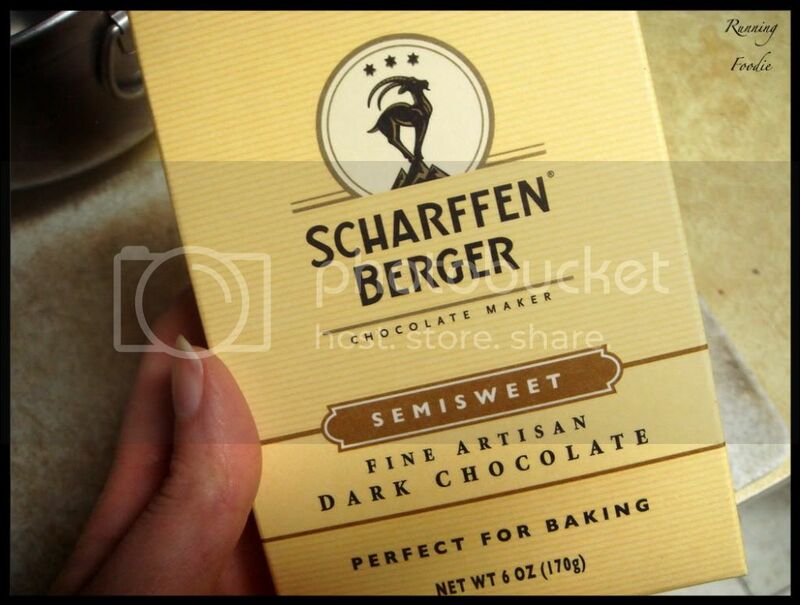 That and Scharffen Berger chocolate is my favorite!! I love that you cut the cheesecake into cubes! Next time I am going to do that. Your pops look wonderful! I love the little cheesecake squares! yum! They're making me hungry for more cheesecake! I never knew a cheesecake water bath worked so well. I always get cracks in my cheesecakes. MmmMmm! Looks so good! I've never used a water bath before. The white chocolate one sounds delicious! That cashew five spice combo sounds delectable. After eating a few I realized that I should have gone for salty on the outside. Your ideas sound just right! They both look so good - but I would especially love to try the white chocolate one. Great job on this challenge! 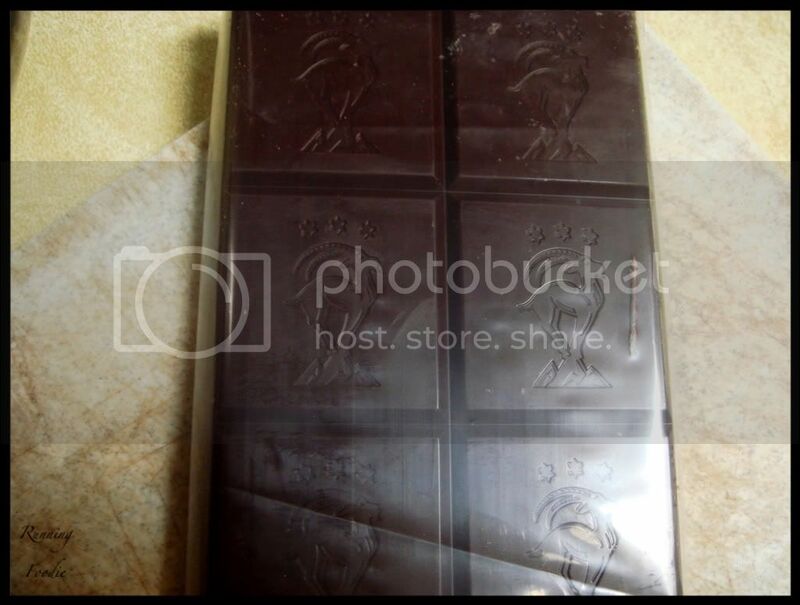 Emm..that chocolate looks SO good! I like that you cut the cheesecake into shapes instead of the balls. So much cleaner looking and really...less messy. I think most of the cheesecake went on my hands. lol. Tony - Cool, another Scharffen Berger fan! Chrismacd1 - I liked the angles that squares and the like give, which was another reason I didn't shape it into balls. Heather - Ahh, I know! I still have so many left in the fridge! Creampuff - I thought of using buttermilk after the DB challenge in March. Now I want to make another cheesecake, but with more buttermilk this time. 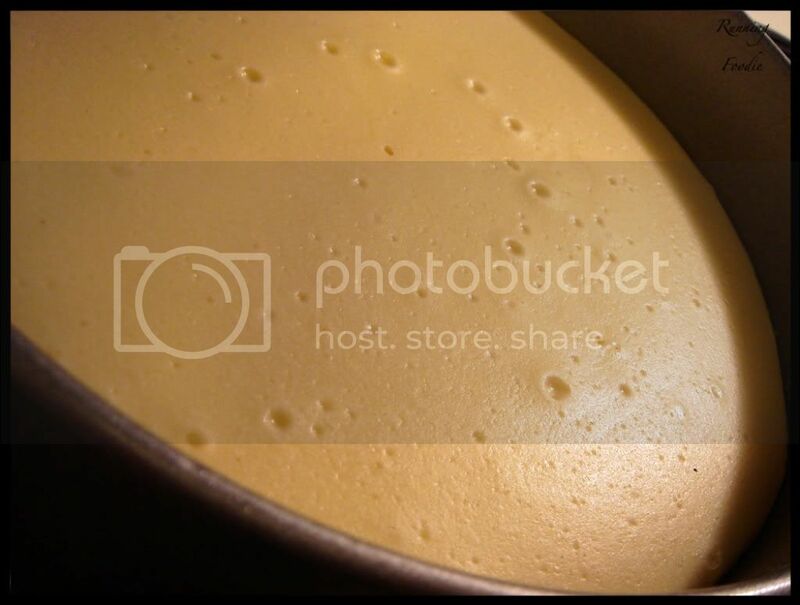 Cupcakelady - It's been such a long time since I've made a cheesecake that I can't remember if mine have cracked before. I usually covered it with a sour cream glaze, so maybe it did. But definitely a water bath gave it a creamier consistency. Colette - Something funny about the white chocolate, I didn't have enough of the Ghirardelli so I used some really old white chocolate squares I had... It sort of tasted like root beer. Weird! I could only sort of taste it on the cheesecake cubes, but I don't think anyone else noticed. Gretchen - The cashews did help cut the sweetness, something which didn't happen on the chocolate pieces sans cashews. I'm pretty much sold on the salty-sweet combination! Deborah - Thanks! I especially like eating some for breakfast!!! Valerie - The mess, ahh! I can't handle the mess! Some of the cheesecake ended up on the knife, but not as much as would have been on my hands. Christina love the white chocolate and Cashews!! YES! And I am delighted to know you were successful with buttermilk! I've written that in, I love using buttermilk!! flat out, the next time I make these I'm making squares (or squares and diamonds, or trianges, or... well, anything that doesn't involve my cookie scoop) yours are ADROABLE and obviously didn't need to be hand rolled after the cutting (scooping). I LOVE the idea of cashews and 5spice - esp with the white chocolate - it SOUNDS right, and can only imagine how good they taste. Bravo on your pops... delightful! 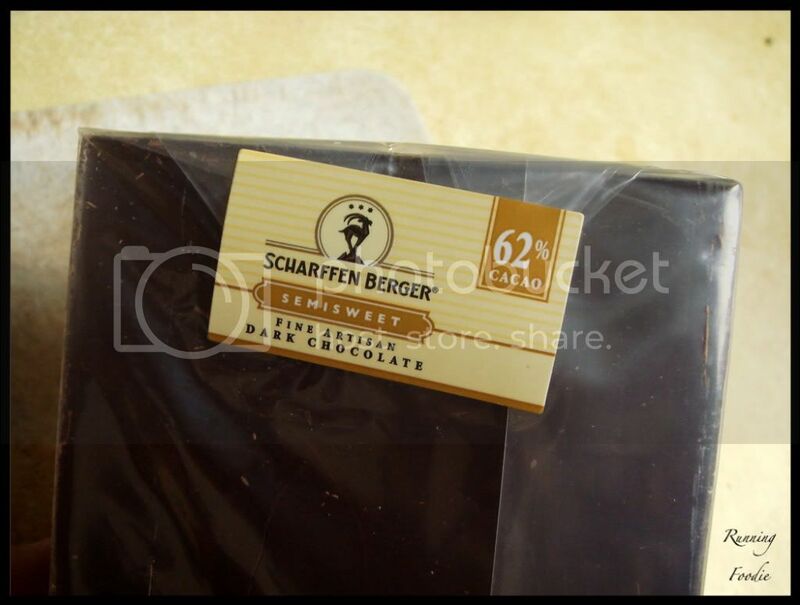 I love Sharffen Berger chocolate! I bet those pops were wonderful. Cashew and 5 spice, way cool, I would have thought of the combination but now that I think of it, it does sound good, really good. Great job with April's challenge, even if it took me way too long to get here. Hard to lose with Sharffen Berger!